To understand the game of fantasy sports baseball, you must first understand the different types of leagues and gameplay formats. Then you will know what you are getting yourself into when joining or even starting a league of your own. Fantasy baseball has many different types of leagues. The leagues usually consist of an equal amount of statistics from both the offensive and defensive sides. For instance, a 4×4 league would consist of scoring done on 4 hitting stats and 4 pitching stats; a 4x4x4 league also would consist of scoring the 4 hitting and 4 pitching stats but would include the scoring of 4 fielding stats as well. Several different combinations of this layout exist — such as 2x2x2 or 5×5 and so on — with 4×4 and 5×5 being the most common of the fantasy league setups. Some leagues are paid and some are free to enter. You can enter many free leagues online that still offer a wining pot at the end of the season, and some even boast a bobble-head trophy to the victor. For example, CBS Sports and MLB.com are two of the more popular free fantasy sites. If your main goal is to make a lot of money, paid leagues are usually the way to go. The leagues usually aren’t stacked with players, so the odds of winning are greater and there’s a better selection of players for your fantasy team roster! The buy-in will vary depending on how much money you are looking to make. Online leagues are usually free to enter and treated like a lottery as a way to get around gambling laws. If your online league offers a cash prize to the wining team, then make sure to check with your local laws to verify your gameplay is not considered a form of illegal gambling in your state! Rotisserie — Wins are based on individual categories or individual player positions. For instance, your league scores wins or losses for batting average, total saves, and total stolen bases, or if scoring on individual player positions, your league scores the wins and losses on the ratings of that week’s catchers, pitchers, shortstops, and so on. The wins then are subtotaled weekly, and the subtotals are added up at the end of the season to decide who walks away victorious. Head-to-Head, One Win — Uses the same scoring strategies as Rotisserie but instead of giving wins for each category, the wins and losses for each category are totaled, and the person with the best win/loss record for the week receives only one win point. The win points are totaled at the end of the season to determine the victor. Points — Statistics accumulate points for each team. For example, your league assigns 50 points for stolen bases and 100 points for homeruns, as well as assigning points for all other statistics categories. If your team players get the most points, you are deemed the winner. This version of gameplay usually pays out weekly prizes for the top-ranking fantasy teams. 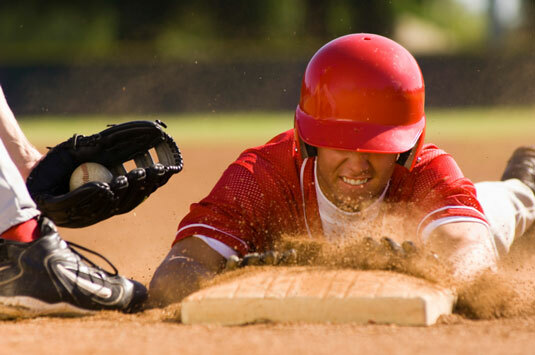 Fantasy sports baseball is mainly an outlet for people who are looking for a more social and interactive way to watch their favorite sports and/or players. Anyone can join a fantasy league. If you have trouble with scoring or draft picks, try asking someone in your league. Most people are willing to help a “newbie.” Most importantly, have fun!